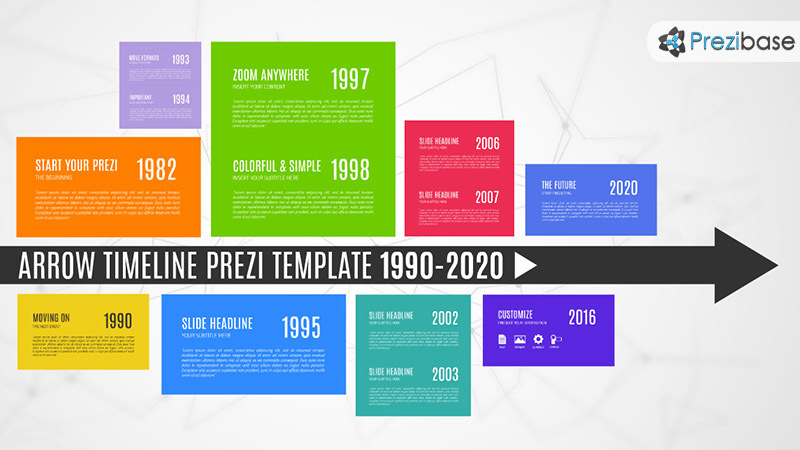 A simple, creative and colorful timeline Prezi Presentation Template with content boxes. Create a business or company history timeline, share memories or important events. Highly customizable template: move, rearrange, resize and change color of every element. Add your own background image, zoom in anywhere for the content details. Individually edit each of the content boxes, add dates, year number or remove them completely. Add as many boxes as you need for your presentation and define the path. This entry was posted in Best Prezi presentation templates and tagged add, arrow, arrow roadmap, arrow timeline, arrow timeline template, boxes, business timeline, clean timeline, colorful, company timeline, company timeline template, corporate timeline template, date, events, history, history timeline, line, number, path, presentation timeline template, prezi templates, simple, simple timeline, template for timeline, time, timeline, timeline template, timelines, year, years.